A LAAMP kick-off event has been successfully hosted by the 24th Congress and General Assembly of the IUCr in Hyderabad. The first kick-off event of LAAMP was held during the IUCr Congress and General Assembly in Hyderabad, India. 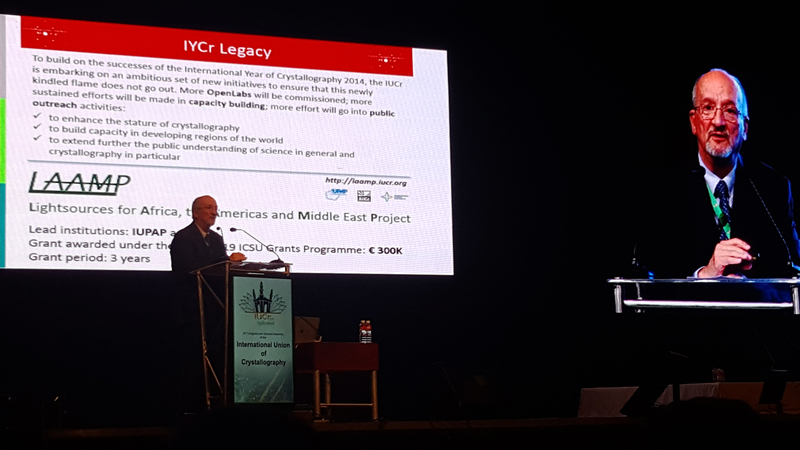 The meeting was opened by IUCr President, Prof. Marvin L. Hackert, and chaired by LAAMP EC members Michele Zema (for IUCr) and Sandro Scandolo (for IUPAP), with over 40 in attendance. LAAMP was also announced by the IUCr President during the Opening Ceremony of the Congress to an audience of over 1500 delegates. The programme and a photo gallery of the event can be found here. LAAAMP is a Joint Programme of the International Union of Pure and Applied Physics and the International Union of Crystallography, supported by the International Council for Science through its ICSU Grants Programme. The ICSU Grants Programme is a competitive, peer-reviewed programme that supports innovative collaborative scientific initiatives of relevance to science and society. The programme seeks to facilitate active collaboration between Scientific Unions and other members of the ICSU community (for example ICSU Regional Offices, Interdisciplinary Bodies, Joint Initiatives, Networks etc) by addressing long-standing priorities for ICSU members in developing science education, outreach and public engagement activities, and to mobilise resources for international scientific collaboration.